Tianjin City Youth Beijing Opera Troupe (TCYBOT) made its debut in London Saturday afternoon by enthralling British audience with the traditional Chinese theater performances. As one of the top Chinese art troupes, TCYBOT has brought a big variety of performance, typically representing different roles in Beijing opera, which combines music, vocal performance, mime, dance and acrobatics. The troupe is making a 10-day performance tour in Britain, presenting local audience four typical excerpts from traditional Beijing opera plays, including Stealing Immortal Herb, Goddess of Heaven Spreading Flower, The Drunken Beauty and The Town of Chisang. 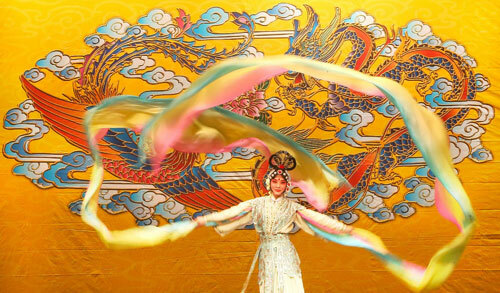 Beijing opera, listed as an intangible cultural heritage of humanity by UNESCO, is regarded as one of the cultural treasures of China, and its play are largely based on Chinese history and folklore. "It is spectacle. This is the first time for me to see Beijing Opera. Although it is different from Italian operas, it is enjoyable," said Len Wilson, who bought tickets to the show with his children and a Chinese friend. Meng Guanglu, a famous Beijing opera actor, told Xinhua that he found that Britons are more interested in Chinese culture than he imagined before. "Culture knows no boundaries," he added. Organized by the MH Culture Ltd of Britain, the troupe will give six performances in Britain and hold cultural exchange meetings in several universities including Oxford and University of London. TCYBOT, founded in 1984, boasts many first-class actors, and has made performance tours in several countries and regions, including Japan, Singapore, Thailand, Peru, Argentina and Mexico.